Home » Blog » UPSC ESSAY STRATEGY: How to Write an Essay! UPSC ESSAY STRATEGY: How to Write an Essay! In one way or the other your fate with UPSC is decided by the most unpredictable component of the syllabus i.e. the ESSAY. Ask your seniors, your peers or even your teachers and no one can come up with a concrete strategy to prepare for essays. It is ironical that despite being the most flexible component of the UPSC syllabus, it is the essay that spoils your chances. Why? The answer to this question is a mystery. So, if anyone tells you that he/ she knows the right way to write an essay and by right we mean the benchmark set by UPSC, be sure that the person has got a long way to go before he/ she can truly understand UPSC. We say this because of a reason. We have seen aspirants with excellent writing skills scoring 70% in essay in their first attempt while barely managing 35% in their next attempt! It is the other way round also with a number of aspirants. Now, here we are! 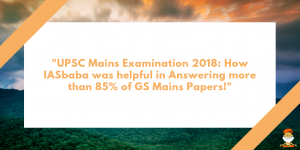 After accepting the unpredictable nature of essay evaluation by UPSC, how can we be sure about any strategy? We can’t and in fact we aren’t. But then, we must try until we touch the right chords. Here we give you a strategy to write essays in the most structured, smooth and satisfactory way possible. We don’t guarantee success if you follow our strategy but we can assure you that after going through the subsequent paragraphs of this write up, you will have a lot to work upon and improve. If you keep in mind the following points, you can definitely better your prospects in essay. So, what is an essay? Or rather why this paper on essays in UPSC? The answer is– an essay gives you an opportunity to put forward your thoughts in a manner that is not impeded by word limit and time (in the sense that you are given enough words and time to express your knowledge and views). It is asked to check the depth and breadth of your knowledge. And when we say knowledge, it doesn’t mean our conventional understanding of the same. The topics are unknown to us before the exam and we are expected to apply all that we have learnt to produce a logical and intelligent account of what is being asked. That is why, one can’t prepare for essays in the conventional sense. Now coming to the strategy part, we must say at the outset that you must not treat essay as any other paper of UPSC. In fact, it is the most innovative way to check your level of preparedness of the entire syllabus of UPSC. If you perceive it in this sense, your tendency to limit your imagination by the fictitious boundaries of so called essay paper will vanish and you will be able to think more freely and more innovatively. Shed all your previous notions regarding this paper and start afresh. The key to writing a satisfactory above average essay is multi-dimensionality. Depth matters but in UPSC breadth is far more important. Keep this fact in mind and approach the essay in a manner that all your wisdom is reflected in the interconnected dots in your essay. Now, what do we mean by this? It simply means the representation of all the dimensions that are related closely to the topic being asked. In doing so, most aspirants keep throwing unnecessary points and that can annoy the examiner. The best thing to do in such a scenario is to write all your thoughts in pointers at the space provided for rough work. Now, this step is very important. What tools do we have to think about as many dimensions as possible? The answer lies in the syllabus. Luckily, the syllabus of UPSC is so exhaustive and detailed that almost everything under the sun is there in the syllabus. After you are done with your own thoughts and written all the possible points, think about the syllabus now. For this, a prerequisite is that you must have learnt the syllabus by heart. Having said so, let us now understand as to how you can use the syllabus to create points for your essay. Indian heritage and civilization: Gandhian thoughts on the importance of letting our civilization welcome others while maintaining our identity and uniqueness. This is particularly important in view of the ongoing clash of civilizations. Women issues: Gandhi’s idea on emancipation and empowerment of women and it’s applicability in modern India. Communalism and secularism: Gandhian message of communal harmony and tolerance. Society: Numerous examples of Gandhian views on the importance of charity, role of family, social capital, social norms, cinema etc. Globalization: Gandhian message of self reliance and it’s synthesis with the idea of global commons/ was Gandhi against globalization? Local governance: Panchayati Raj as envisaged by Gandhi. International relations: Gandhian ideals of co-existence, non- violence, non- proliferation etc applied to the current foreign policy paradigm; satyagaraha and non- violence as tools to pursue foreign policy goals. Agriculture and animal rearing: Gandhi’s ideas on organic cultivation, supplementary income through animal rearing etc. All Gandhian ideas with respect to revenge, change, forgiveness, happiness, strength etc reflect the essence of this component of the syllabus. We can use all of them wisely to make our points look better and logical. Having shown you the importance of knowing the syllabus by heart and keeping oneself updated with the current events, we move forward to the next important phase of essay writing i.e. the structure. There is no universally accepted format for writing an essay. However, there is a general understanding about how one should approach an essay. Of course, one has to start with an introduction. Introduction can start with a quote, an anecdote or a simple paragraph. Irrespective of the approach, the introduction must give an idea to the reader as to what ensue in the subsequent paras. Introduction should be crisp and interesting. Don’t use cliched sentences in the introduction. In the next few paragraphs, you are supposed to touch upon the core areas of the essay. Here, the points in the back of your answer sheet will come handy. Prioritize the points in a manner that the essay follows a logical flow of ideas and related points are covered in the same or back to back paras. For example, in the example given above, you can’t start with the Gandhian views and it’s applicability regarding local governance, then hop on to the role of non- violence in international relations and then come back to tolerance towards various civilizations. Similarly, you can’t club the ideas of self dependent villages and communal harmony in the same paragraph. At the outset itself, you must have in mind the flow of your essay. It is important to note that not all your jotted points need find a mention in the essay. You can trim the points and in fact eliminate the irrelevant ones to make your essay crisp and close to the central argument. It is also important that you read the topic after all your paragraphs so that you don’t deviate from the central theme. All the paragraphs must have their own personality. There should be no loose ends. The paragraphs in themselves have to have logical conclusion and if that is not possible, at least the key to the next paragraph. Randomness and unpredictability are the last two things that your essay needs. Coming on to the conclusion part of the essay, it must be understood that you are not supposed to force yourself in producing an intelligent conclusion. Many a times it is better to let some question remain answered. It is not because it should be so, but because it is not possible to have a satisfactory answer always! Just make sure that your conclusion is balanced and there is some amount of optimism in your views. Don’t predict doomsday in the essay even if you are the most depressed person in this world. UPSC wants to recruit happy and optimistic people. Mind it! Now the question comes about language. What sort of language should one use- simple or ornamental, straight or flowery? The answer is write the way you have always written your essays. The bottom line is you have to impress the examiner in whichever way possible. If we suggest you to use simple language and you are actually good in writing impressive English, the chances are you will spoil your attempt in trying to become what you are definitely not. It is not possible to change one’s writing style so quickly. Instead one should try to make his/ her style of writing fetch better marks in the essay. Is it not that a bride wearing all the ornaments and makeup looks stunning but at the same time a lady with a beautiful eye but with no makeup or jewelry looks equally beautiful? The same holds true for language. Believe in your own style and remain confident. However, we find it prudent to caution you about being superfluous. This can be fatal. Don’t beat around the bush. Your sentences must convey what you have in mind and their length should be commensurate with the message. Don’t use too long a sentence. Be crisp and to the point. As far as essay is concerned, DO NOT write in points. Once in a blue moon, candidates might have scored good marks by following this approach but that is an exception and not the rule. Respect UPSC and don’t do anything foolish. Use quotes selectively and wisely. Not using a quote is way better than using it wrongly. You can prepare a list of quotes that can be used in the essays asked by UPSC. Be creative in your writing. Spend some time in thinking about the ways in which you can improve your presentation. Ask your peers to review your essays and point the glitches. Try to improve upon the content, presentation and approach by keeping in mind the given strategy. We are sure that in 3-4 attempts, your essays will start reflecting your efforts. We at IASbaba will keep on posting challenging topics for essays. We expect you to attempt them in strict exam conditions. FREE ESSAY CLASS – Exclusively for MAINS 2016!